The PHILADELPHIA Cream Cheese helps make this the perfect dessert to serve at your next gathering of friends or family. Mix ginger crisp crumbs and butter; press onto bottom of 9-inch springform pan. Beat cream cheese spread and sugar with mixer until well blended. Add 1 cup mango pulp, corn starch and cardamom; mix well. Add eggs, 1 at a time, mixing on low speed after each just until blended. Pour over crust. Bake 50 min. or until centre is almost set. Run knife around rim of pan to loosen cake; cool completely before removing rim. Refrigerate cake 4 hours. Meanwhile, bring remaining mango pulp to boil on high heat; simmer on medium heat 4 min. or until reduced to 1/2 cup, stirring frequently. Cool. Refrigerate until ready to use. Top cheesecake with mango pulp just before serving. 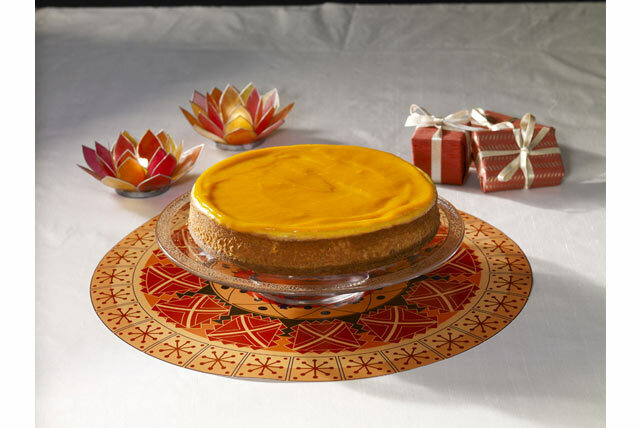 Garnish cheesecake with fresh mango slices or chopped toasted pistachios just before serving. Available in most Indian grocery stores, the sweetened mango pulp has a thick consistency with concentrated mango flavour.